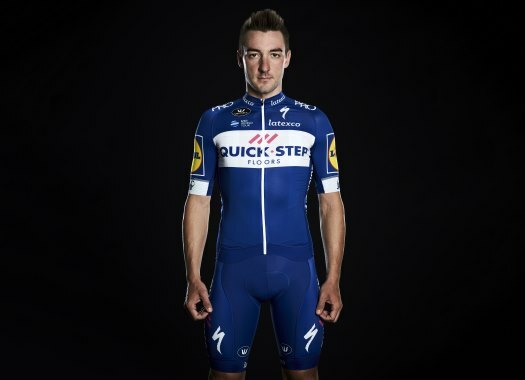 Quick-Step Floors' Elia Viviani was the strongest rider at the sprint of the second stage at the Giro d'Italia. Rohan Dennis took the Pink Jersey at the end of the stage. The second stage of the Italian grand tour was 167 kilometres long and started with the escape of Davide Ballerini (Androni Giocatolli), Lars Bak (Lotto-FixAll) and Guy Niv (Israel Cycling Academy). The riders created a gap of more than three minutes with the pack, but the speed behind them made their adventure a very short one that finished at 75 kilometres from the finish line. BMC Racing Team had the objective of setting a high rhythm in order to position Rohan Dennis perfectly to take the intermediate sprint, which would give him the needed bonus seconds to wear the Pink Jersey at the end of the day. The team was successful and the Australian jumped to the top of the GC with a 1-second advantage on Tom Dumoulin (Sunweb). Soon after, Victor Campenaerts (Lotto-FixAll) tried to escape but was reeled back in some kilometres later. At more than 40 kilometres to go, it was the turn of Guillaume Boivin (Israel Cycling Academy) to try his luck. The Canadian was caught by the peloton with around 15 kilometres to go and the pack prepared for a final sprint. Teams like Bora-hangrohe, Bahrain-Merida, LottoNL-Jumbo and Quick-Step set the pace with their own sprint trains. Riders like Tony Martin and Jose Goncalves (Katusha-Alpecin) tried to escape, but the speed of the pack was too high for any to succeed. With two kilometres to go, Lotto-FixAll's Tosh Van Der Sande was stronger in his attack, but the others caught him some metres later. The last metres were fast and dangerous and Elia Viviani (Quick-Step Floors) showed to have the stronger legs. The Italian beat Jakub Mareczko (Wilier Triestina) and Sam Bennett (Bora-hansgrohe). Dennis completed his collection of leader jerseys of grand tours after already having worn the ones of the Tour de France and the Vuelta a España.